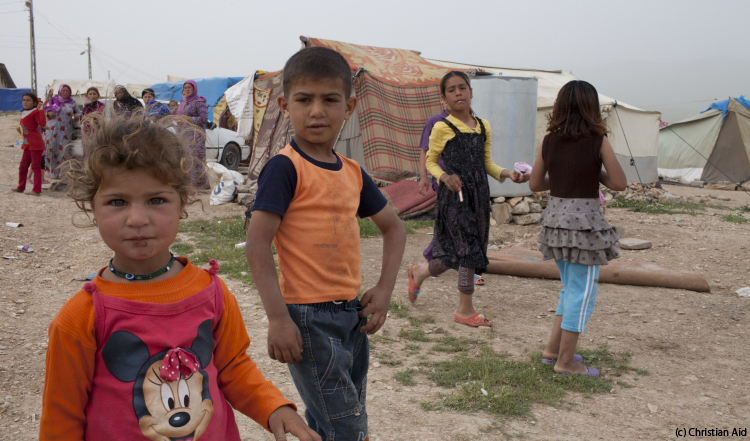 To mark the start of this year’s Christian Aid Week, Christian Aid’s Head of Middle East Region, Janet Symes has written exclusively for God and Politics on her experience of visiting a Syrian refugee camp in northern Iraq. ‘Are you angry?’ asked 13-year-old Ahmed after we had been chatting together as he told me about his life in a Syrian refugee camp a few miles outside Sulaymaniyah, in northern Iraq. Sulaymaniyah is a bustling, vibrant, rapidly growing city – in the last few years thousands of people have moved there from the surrounding countryside and other parts of Iraq seeking the greater opportunities for work or education that a thriving and relatively peaceful city provides. But the refugee camp couldn’t be a more different place. On the day we visited, there had been a torrential rainstorm, with water running down the alleys between the tents in torrents. The only people who seemed to be moving around were a small group of young men with plastic bin liners over their shoulders in the vain hope of keeping dry as they desperately dug trenches to channel water away from several flooded tents. The people here had already lost pretty much everything: loved ones; treasured possessions; their homes; – and here they were, struggling to protect what little they had left. Ahmed, a lively lad full of energy, ideas and optimism, told me in excellent English how he was teaching his friends to speak English. ‘That’s my school over there’ he said as he pointed to a large shed-like building. He told me that his teacher is great, that he loves learning and maths, but that his favourite subject is English. He wants to be a doctor, he told me, to help all the people who are hurt and stop their pain. I could only imagine the experiences conveyed by the intensity in his voice and eyes as he spoke. He was a Barcelona fan, he told me, and loved playing football. He’d made friends here – but his real friends were in Damascus… or at least somewhere… he hoped. And he wanted to play football with them again. I’m angry he said. I’m angry because I want to go home. I want to go to my school. I want to be with my friends. That’s when he asked me if I was angry too. I didn’t have to search for an answer. Yes, I am. I’m angry. I’m angry because children like Ahmed have had their lives devastated by this conflict. I’m angry because up to 150,000 people have lost their lives and many thousands more have been wounded. I’m angry because over 2.5 million people have had to flee Syria and live as refugees in neighbouring countries – over a million of them in Lebanon alone, a country with a population of just over 4 million before the war. I’m angry because today there are over 9.5 million people in need of humanitarian assistance inside Syria –almost a quarter of a million of them living in besieged areas aid cannot reach , despite a UN security council resolution demanding access for humanitarian assistance agreed unanimously back in February. This week the UN reported that in the past month only 10% of people in such areas had received assistance. And I’m angry because so far efforts towards achieving a peaceful, political solution have failed to bring about the results that will mean Ahmed can go home. But I am also heartened to meet people like Ahmed. I’ve met many refugees who are doing so much to make the most of their lives and who are helping others. I’m inspired by the courage of the many Syrians who are working in unimaginably difficult and even dangerous circumstances to get assistance to as many people as they can. I’m inspired by the people working in our partner organisations in Iraq and Lebanon who are doing so much to support people affected by the war across the region. And I’m heartened by the generosity of Christian Aid supporters that means that we can provide assistance to people like Ahmed. No, it’s not enough – with so many millions of people in desperate need there is so much more to be done. But it does make an important difference to many people’s lives. But the fact remains, the only way this humanitarian crisis can end and Ahmed can go home is if a peaceful solution is found. 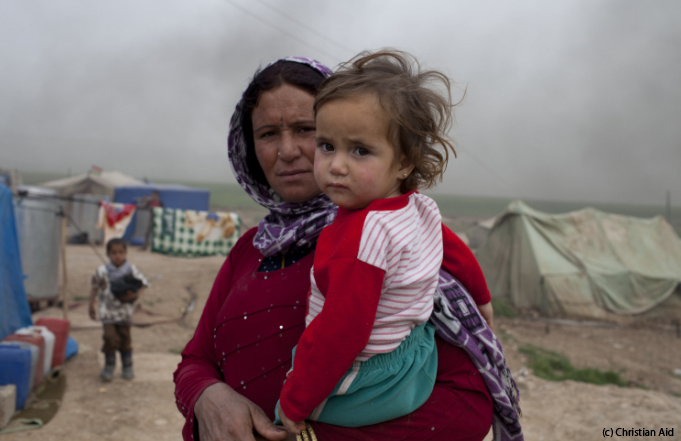 To date, Christian Aid has reached almost 40,000 people within Syria and the neighbouring countries of Lebanon and Iraq with a combination of shelter, food and essential items, as well as education and psychosocial support. 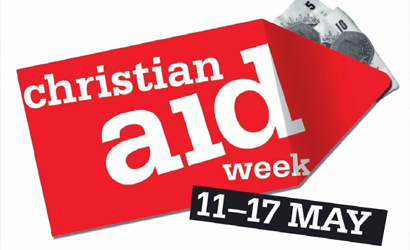 This year’s Christian Aid Week (11-17 May 2014), is asking the British public to support communities in war-ravaged countries to rebuild their lives and live a life free from fear. ‹ Is the Church of England now the Labour Party at prayer? Reblogged this on Essential Thinking.